‘There is more than one way to picture a tree.’ So begins this magical, deceptively simple book that uses metaphors and visual imagery to set children’s imaginations whirling, not only about trees but about the people around them too – for while the text reads like a poem about looking at trees through the seasons, the illustrations invite young readers to compare the trees and the people who share their spaces. Before seeing Picture a Tree recently, I had not come across Barbara Reid’s work and I was bowled over. Her artwork, all done with plasticine, is stunning: vibrant, dynamic and filled with details. Just watch the video below of how she created one of the illustrations and see how she has layered not only the plasticine but the inferences. The text for this page reads: ‘A tree can be a high-rise home sweet home.’ As we look through the tree into the windows of the block behind, we notice that the six scenes are echoed by the creatures living in the tree – a cat and a raccoon are both curled up fast asleep; someone just awake is peeking out to greet the new day through their curtains, like the woodpecker in its hole; a baby person and baby birds are being fed; birds outside and a parrot inside are wating for their breakfast; a mother is chasing her mischievous son, just like the squirrels outside; and a woman is chattering on the phone – just like the wasps buzzing around their nest in the tree outside?!? In fact, the gentle wit throughout the book is what gives it its enduring character: both children and adults will be drawn to exploring these parallels that give the imagination freedom to fly. In one illustration there’s a mother with her baby in a push-chair sharing the shade under a tree with an old man in a mobility scooter. Baby has a toy rabbit; the old man has a dog in his basket… Another spread shows four people standing facing out towards us, waiting at a bus stop. Behind them are four winter trees in a ‘game of dress-up’ – clouds and birds give the bare trees temporary clothes. What is hilarious, though, is the way each person’s hair (or lack of it!) is mirrored by the effect on the tree behind them. It’s subtle and clever. Once children notice it (and they will), they will love it: and the same goes for the whole book. Then, at the end, comes the echo of the book’s title and a question: ‘Picture a tree. What do you see?’ – so now it’s the young reader’s turn to give their imagination full rein: and following the great warm-up Picture a Tree offers, no doubt they will come up with something wonderful. They’ll cetainly look at trees and maybe the people around them in a new light the next time they go outside. I still can’t get over the virtuosity of the illustrations, but even without taking that into consideration, Picture a Tree is a joyous, fresh exploration of the trees that are so often an un-noticed part of urban life, as well as, cleverly and unobtrusively, of the diverse people, especially children, who populate it. 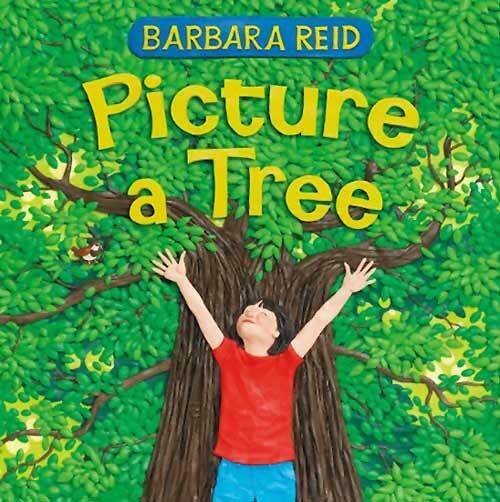 Barbara Reid, children's books about trees, MWD book reviews, North Winds Press, Picture a Tree, Scholastic Canada, trees. Bookmark. What a unique and fascinating story! I love books that grow the more you examine them. Thanks for this review and for linking up with the #KidLitBlogHop. I hope you’ll join us again this Wed! Thank you, Katie – and yes, I love when I find a book that does that, too.